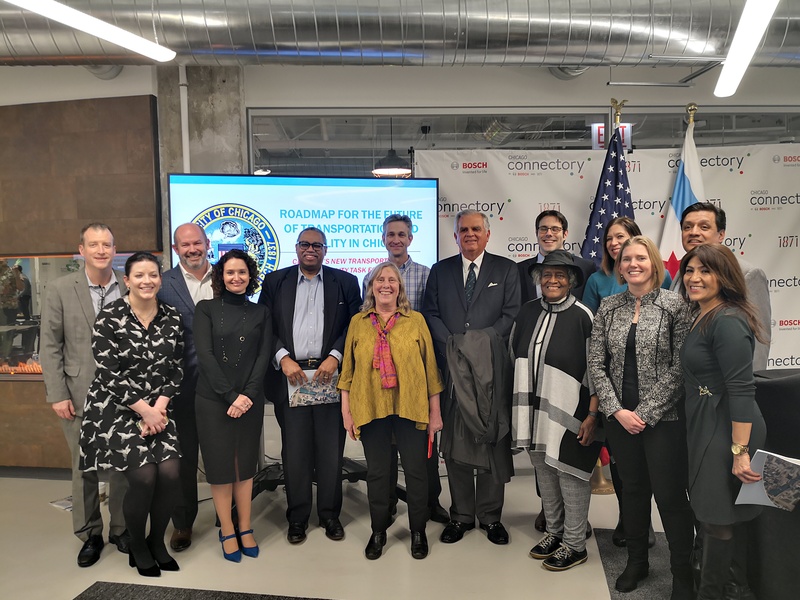 On March 14, the Chicago Connectory (the local tech incubator that includes SUMC’s home office) welcomed Mayor Emanuel to present the Roadmap for the Future of Transportation and Mobility in Chicago, a report developed by the New Transportation and Mobility Task Force. Created in September 2018 and chaired by former US Secretary of Transportation LaHood, the Task Force comprises more than 20 experts and thought leaders from the transportation, mobility, and technology sectors, including SUMC Executive Director Sharon Feigon. 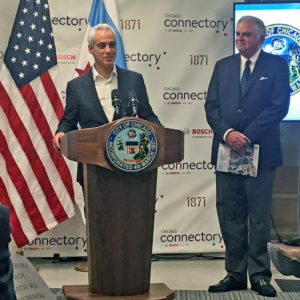 Mayor Emanuel speaks at the Chicago Connectory on March 14, 2019. In the fast-evolving mobility world, ridership is changing, new service options are appearing and disappearing, and an aging infrastructure is struggling to support new commuting and development patterns. The task force was charged with developing a set of principles to guide the future of Chicago’s transportation system. From these principles came a series of seven overarching objectives supported by 50 actionable recommendations and defined next steps to ensure that the city’s transportation system will provide choices that are safe, equitable, and sustainable to all residents. The Task Force met monthly from October 2018 – February 2019, addressing the current state of mobility in Chicago (decreasing public transit ridership, the need for a fully accessible mobility network, a rise in lower-capacity, low-efficiency trips among others) as well as how to best integrate new mobility technologies that are changing our transportation landscape. can you buy metronidazole over the counter Seven principles ground present and future mobility developments. more info Seven interdependent objectives provide a framework for the recommendations that follow and promote a safe, equitable, accessible, adaptable, and environmentally sustainable multi-modal transportation system in Chicago. In April 2019, Chicago will be electing a new mayor. This roadmap, which is intended to be workable immediately, details essential next steps to be taken in the next six months. 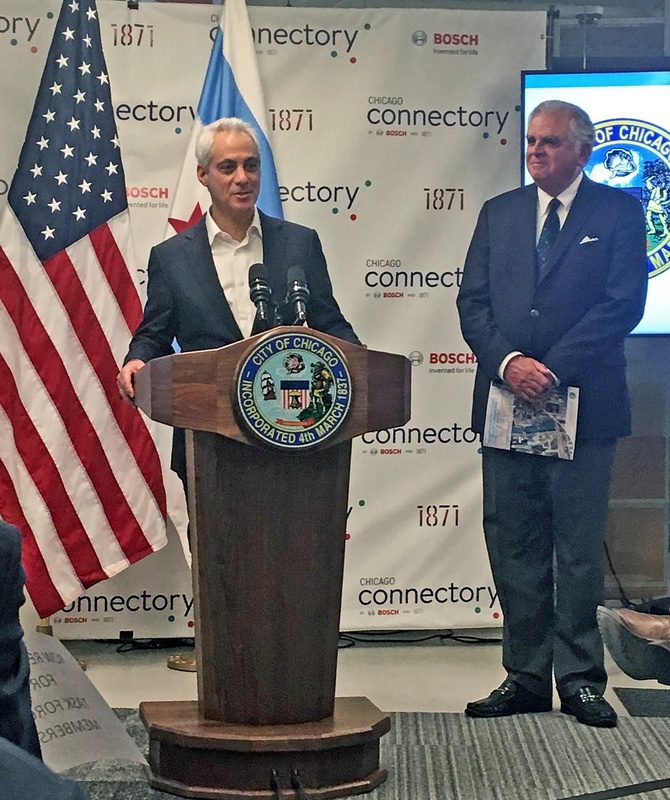 The task force will continue to support the implementation of these recommendations with the new administration and guide future mobility developments in Chicago.